which is located just off the A76 between Dumfries and Thornhill. We were seated in the lounge for 'pre-tea' drinks, where they had kindly lit the fire, as it was only about 11C today after all the lovely sunny weather we have had this week. We then moved to the dining room, which has french windows with a view of the garden. The table was set with vintage china, linen napkins in silver napkin rings and little vases of lilies. 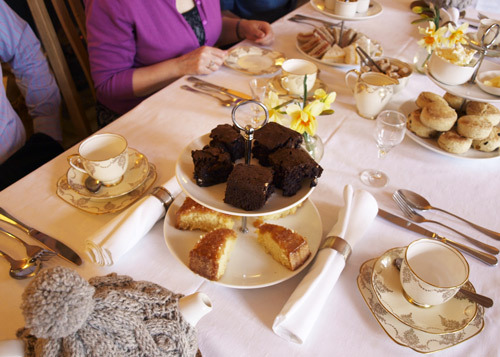 We opted for the full Vintage Tea at £7.50 per person, this included sandwiches, scones with butter, cream and jam and cakes, and as much tea as you could drink! The sandwiches looked the part as they were small, crustless triangles with fillings of smoked salmon, cheese or ham. They were fresh and tasty, although I did feel that the fillings were a little uninspired and plain. There were plenty of scones, enough for one plain and one fruit each person, they were warm, which was good, but a little bit heavy in the centre. That didn't stop me slathering on the cream and homemade jam. We had two types of cake, some very rich and sticky chocolate brownies and a lemon drizzle cake, again plenty for everyone. 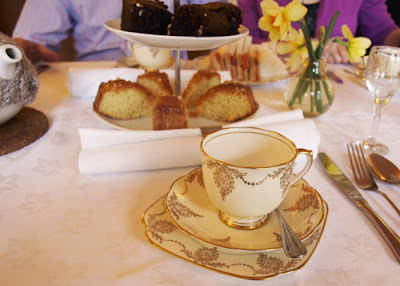 It was a very good afternoon tea, good value for money (even though I wasn't paying!) and I really enjoyed it. However, from a review point of view, I think I would be prepared to pay a little more to have a few more interesting sandwich fillings, some light fluffly scones and perhaps a few perfectly decorated cupcakes or fondant fancies. This is, of course, not part of The Food Bloggers Diet and I'll have to work hard over the week to make up for this indugence. sounds the perfect way to spend an afternoon and excellent value for money! Well it looks like a very nice table setting Janice. But £7.50 does seem very cheap, so I guess it's no surprise it wasn't quite up to the mark. What a lovely thing to do though and hopefully you had fun. 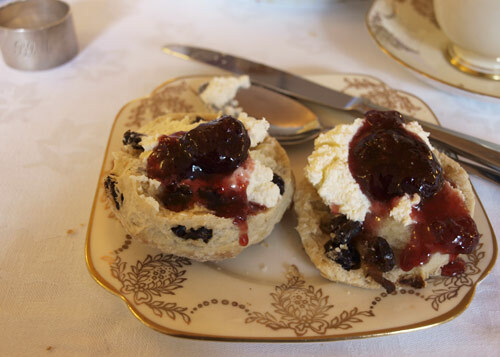 Aw how lovely to be treated to afternoon tea, the scones look good slathered with cream and jam! yum yum Janice that was good value for money and I was surprised at the sandwich filling choices too. No cucumber? Those scones look delicious - I think I'm in danger of becoming an afternoon tea addict. I must attend a vintage one soon. Sounds like a lovely way to spend an afternoon - good friends and good food. I love afternoon tea! I love the tea cup and saucer I am in danger of becoming a vintage china addict! I left a comment here on my blackberry, but can't see it now.....I think that is happening a lot to me lately.....Sorry to seem like I am not here, but I AM! And, as you know, I LOVE a good afternoon tea, and this looks FABULOUS! I love afternoon tea especially the scones, jam and cream!